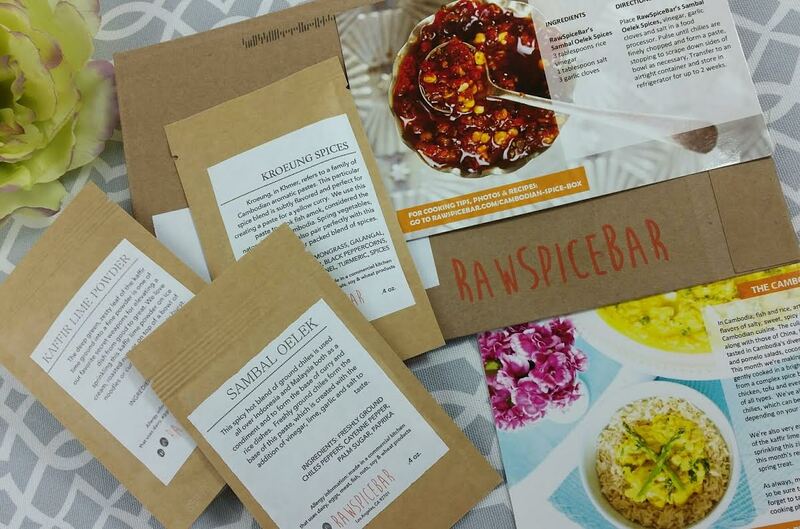 RawSpiceBar is a subscription for the kitchen! You'll receive three different spice blends each month all curated around a world cuisine. I've been particularly enjoying the variety the recipes they send add to my menu. Since the spices are usually the most expensive and elusive part of recipes from exotic lands, this is an excellent way to try new things without breaking the bank on your spice cupboard. This month the spices and recipes feature Cambodian cuisine. The traditional dishes have been influenced by China, India and France and are a balance of salty, sweet, spicy and sour. Foods like mango salad, coconut curries, stirfries and barbeques are common. 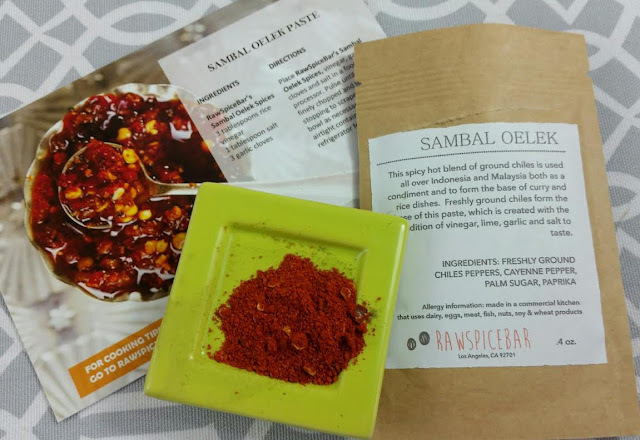 Sambal Oelek- I think this is the first time I've seen a repeat spice blend! 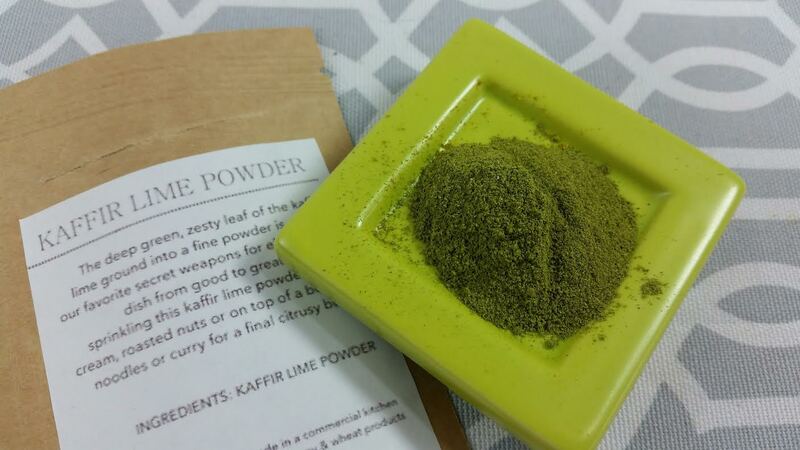 This blend was also part of the Malaysia shipment and it was amazing. I used it in a meat dish that was basically a chili and my husband loved it. I'm glad to have more. It's a spicy blend of chili peppers, cayenne pepper, palm sugar and paprika. The suggested recipe is a chili paste but I don't think I'll use it that way. 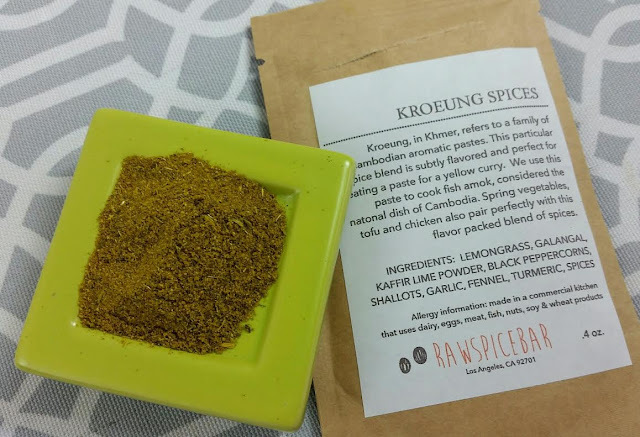 Kroeung Spices- According to RawSpiceBar, Kroeung refers to a family of Cambodian aromatic pastes. This blend is perfect as a base for yellow curry but can also be used with vegetables, tofu, chicken or fish. I'm going to use it on chicken even though there's a fish recipe for this. Or maybe I'll make their recipe but use chicken instead because it does sound pretty good. It consists of lemongrass, galangal, kaffir lime powder, black peppercorns, shallots, garlic, fennel, turmeric and... spices. (It always weirds me out when they put "spices"-- why not just list them since all the others were?). VERDICT: If you love adventurous cooking, you're going to love this. If you love creating exotic meals without having to fork over $10 for a whole bottle of spice you may not use again, this is the way to go. The only bad thing about it is that you can't get more of a spice blend you love. I hope they'll add a store to their website soon. We've been introduced to some wonderful foods and several new spices by RawSpiceBar and some of the recipes have become a permanent fixture in my repertoire. I think this month was really late since I just got it and it's June but the website says this is the May box. My last one was late, too, so I'm not sure what's going on.